Three years ago, at age 15, Maftuna’s parents married her off to an older man she had never met. Today she is an 18-year-old single mother living in with her parents in a suburb of Osh, Kyrgyzstan’s second largest city. “My husband turned me out of his house with our two children,” Maftuna (not her real name) told EurasiaNet.org, breaking into tears. Her children are now aged two years and six months. 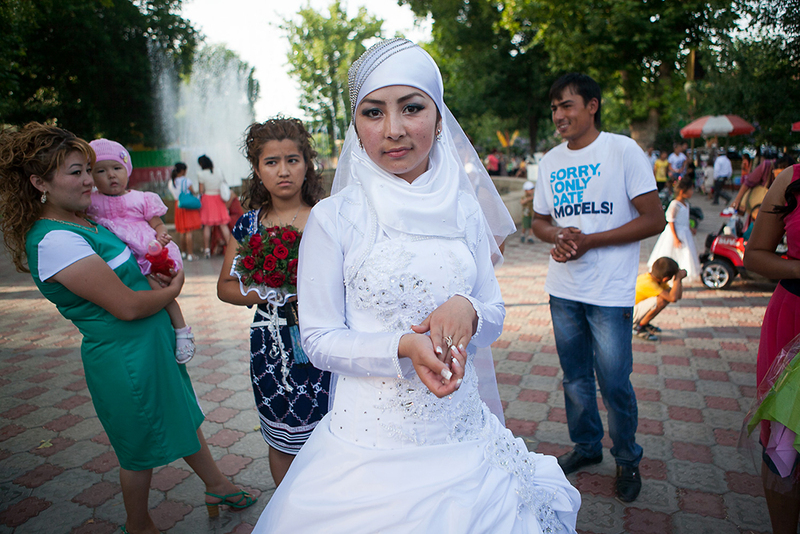 Kyrgyzstan’s minimum legal marriage age is 18. But since the fall of the Soviet Union, weddings increasingly have been performed by Islamic clergy in a ceremony known as nikaah that is often not registered with the state. Because the marriages fall outside of state control, there is no oversight to ensure the bride and groom are of legal age. Experts like Jamilya Kaparova, head of Ensan Diamon, an Osh-based NGO that addresses women’s issues and gender violence, believe nikaah ceremonies are being used to hide underage marriages. Kaparova says the marriage of 15-year-old girls is not common, but says she has seen a growing tendency of parents to marry off their daughters at age 16 or 17. Research Kaparova conducted with a local human rights organization, Bir Duino, found that of 2,000 women surveyed in southern Kyrgyzstan, about 12 percent married before age 18. “In most cases they are 16 or 17, but there are cases when 15-year-old girls are forced to marry, too,” Kaparova told EurasiaNet.org. Kaparova says such marriages rarely endure because such brides are in fact children and cannot satisfy their husbands or please their in-laws, a cultural imperative in Kyrgyzstan. One survey her organization conducted found that 79 percent of underage marriages quickly ended in divorce. “Such girls may look mature at the age of 15 and seem ready to bear children, but in fact they are children themselves,” Kaparova said. The brides are often left with limited options. Girls who wed as teenagers often do not finish school. Moreover, they cannot claim alimony or sue their husbands in the event of property or financial disputes because Kyrgyz law does not recognize marriages performed by mullahs. And although such marriages are illegal, criminal charges are rarely brought because few families file complaints to the police. In research for the Norwegian Helsinki Committee published in 2013, Larisa Ilibezova found that nine out of 11 child brides experience psychological and/or physical abuse at the hands of their in-laws and husbands. “Such girls do not seek assistance from the police, crisis centers or local authorities,” Ilibezova told EurasiaNet.org. Many, she said, were unaware of legal provisions protecting them and many did not know that marriage under age 18 is prohibited. In February, Elisabeth da Costa, regional representative for the UN’s High Commissioner for Human Rights, said that “the rise in unregistered marriages is symptomatic of a return to traditional values brought on by the socio-economic hardships in Kyrgyzstan.” The difficulties have been exacerbated by the massive migration of Kyrgyzstanis to Russia in search of work. “As a result, traditional values, often along patriarchal lines, took over,” da Costa explained. Another indicator of the rise in child brides is the steady rise in births to girls aged 15-17 years, from 4.4 children per 1,000 women in this age group in 2006 to 7.9 children in 2013, according to the National Statistics Committee. Abdumalik Aidarov, a gynecologist and the head of a private medical center based in Osh, said the trend comes with troubling health implications. Aidarov echoed multiple rights activists who say that girls under 18 should be discouraged from sexual activity. “It is not for nothing that 18 has been defined as the legal age for marriage,” he said. Yet in an informal canvassing of Osh residents, many told EurasiaNet.org that they support early marriage, arguing that girls can be married after they start menstruating. A retired imam based in Osh says he disapproves of young girls marrying, and complains that the secular government too often blames Islam for the trend. Hamid Tursunov is a freelance writer based in Osh.